Venerable Khen Rinpoche Jei Samten Drodul Dorjee was born in the cool land of the Snowy Ranges at Kham Riwoche, East Tibet. At the tender age of 7, he entered the monastic order of Taklung Kagyu, Riwoche Great Monastery under the tutelage of H.E. Choktul Tenzin Gtaltsen Ngawang Mawai Nyima Rinpoche. He later furthered his studies in Buddhist Philosophy at Riwoche Shedra (College) under Khenchen Sherab Palzang Rinpoche and other Taklung Kagyu Masters. Khen Rinpoche spent the next ten years studying Buddhist Philosophy at Nyingmapa Monastic University at the famed Namdroling Monastery founded by H.H. Penor Rinpoche in southern India. He successfully completed his university studies amidst great hardship and was conferred the title "Khen Rinpoche" by Taklung Kagyu Great Masters. Khen Rinpoche means "The Elucidator of Sutra and Tantra Teachings". This is the highest degree equivalent to a Doctorate. He has since, received many ripening empowerments, liberating instructions and supporting oral transmissions from Great Masters of the four major schools of Tibetan Buddhism. He is also a Master in Tibetan Buddhism rituals. Khen Rinpoche has traveled widely to China, Hong Kong, India, Indonesia, Macau, Laos, Nepal, Thailand, Tibet, Singapore and Malaysia for Dharma teachings. He played a major role in the 7 over years' restoration and printing of the long-lost Taklung Kagyu Lineage Dharma Text Project. He oversaw the setting up of Tashi Pal Four Gems Library in Riwoche Great Monastery to cater to the reading and research needs of the Sangha and lay people. He is also looking after the educational needs of the young Sangha there. His other projects include helping the Mahasangha's studies, set up Tashi Pal Lhalung Yangwen Retreat Center at Kham Riwoche and the construction of Taklung Kagyu Tashi Pal Zagol Tsodrak Drubdhe Samten Ling Retreat Centre in Sichuan for two Monasteries and founded Tashi Pal Foundation. He also initiated and founded Riwoche International Friends Association (RIFA), a forum for the exchange of the Dharma and the preservation of Tibetan culture and traditions. Khen Rinpoche is very simple, compassionate and easy going. He is always ready to offer help to those who need it. His main interest is to teach and share the Dharma. 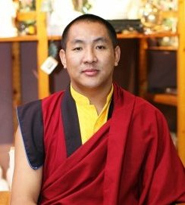 He is currently studying English in order to propagate the Dharma more effectively. His aspiration: "To open the eyes of someone who is in darkness in order that they can see and walk on the path to enlightenment". He added: "We are suffering because of our ignorance. Enlightenment is the door to happiness, peace and joy. It is truly free from Samsara and Suffering"